During the event to launch the underwater ELLA-LINK telecommunications cable that took place in the city of Sao Paulo, Brazil, the Spain’s Prime Minister Mariano Rajoy, explained that the new connection will reduce the time to transmit data by 40%, as well as improve the quality, reliability and confidentiality of communications between Ibero-America and Europe. Rajoy commented that the new cable is “a necessary connection between Europe and Ibero-America and “an example of public-private cooperation”, in which the European Union has also played a “very important” role, with a contribution of 25 million euros. Rajoy also pointed out that the new underwater cable, which connects the cities of Fortaleza and Lisbon – to then connect with Madrid – is “a modern connection” with a very high capacity of “no less than 72 terabytes per second”. 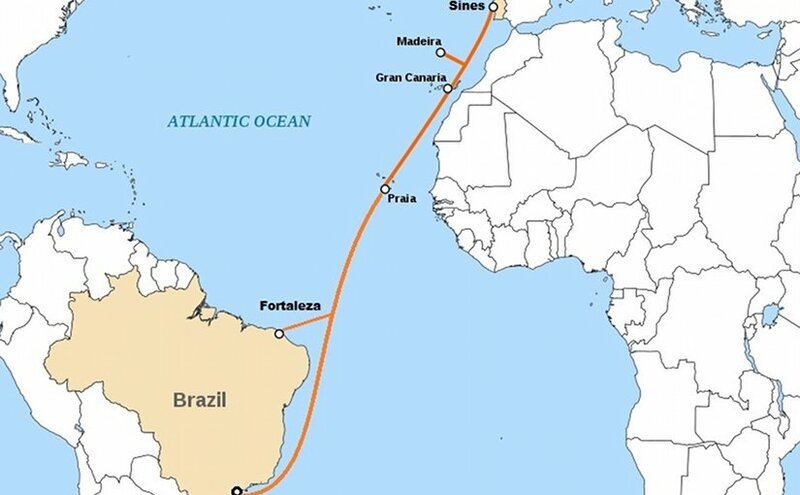 Route of ELLA-LINK telecommunications cable from Brazil to Portugal. The cable also links to Madrid, Spain. Credit: Cvdr, Wikipedia Commons. According to Rajoy, the new connection between Latin America and Europe “will reduce the time to transmit data between the two continents by 40% and will also help us to improve quality, reliability and confidentiality”. After congratulating all those who participated in this “pioneering project”, Rajoy recalled that the first underwater cable between America (from the United States) and Europe was laid in 1850, but broke within a year. During the following years, technological progress led to new cables being laid, up to 15, always between North America and Europe. Rajoy asserted that the ELLA-LINK is “a project that joins two continents”, a union that “symbolizes the special ties that unite Europe and America and that is a manifestation of our shared past” and “a future full of opportunities”. In short, he added, “it is a project with tremendous strategic value” and with a “vocation to be extended” to the Pacific coast (to connect with the European Southern Observatory in Chile). Rajoy also stated that the new underwater connection will lead to the parallel development of other projects, such as the Bella Project (a consortium of scientific and academic networks from the two continents), the Clara network (which works to strengthen the development of science, culture, education and innovation in Latin America) and the Geam Network (located in Europe).